D1 'Scafell Pike' at Derby on August 30th 1959, with shining paint and barely a week to go before it enters revenue earning service. The previous day (29th) D1 was noted stabled on the London Road curve, Derby. The Modernisation Plan which called for the replacement of steam by diesel and electric traction presented the architects of the Plan with many questions, often with a multitude of answers. In many cases there was no definitive 'right' or 'wrong' answer, the global use of diesel locomotives was still very much on a learning curve, with some solid successes and also many dead ends. Many manufacturers and engine builders had sent locomotives to almost all corners of the world, in some cases there was some twenty five years of operating experience to fall back on. But these operating experiences for the recently formed British Railways often threw up more questions than answers. Would British Railways opt for the light weight higher speed engines often aligned to a hydraulic transmission or would they choose the bulkier and heavier medium speed diesel engine, usually coupled to an electric transmission with its associated bulky and heavy generators and traction motors. The latter had its following within British Railways but the considerable bulk of the engine and transmission would create a heavy locomotive to the chagrin of those concerned with axle loadings and stresses imposed on the permanent way and associated structures. As it happened for British Railways a number of options were taken and it was left for BR Derby to draw up some of the plans and construct certain of the locomotives equipped with the medium speed engines coupled to an electric transmission. Derby had almost two decades of diesel experience, dealing with the familiar 0-6-0 shunters, the two LMS express passenger locomotives of 1947/48, the experimental Fell locomotive and the very beginnings of production of the BR/Sulzer Type 2's. The engine chosen to power the BR/Sulzer Type 4's had its roots in development dating back to the early 1930's, in the Sulzer LDA series. Development had taken this design to a maximum of eight cylinders in the single bank form. Experiments with two double locomotives to France and Roumania during the late 1930's powered by Sulzer 'double-bank' engines had been successful, the four machines were still operating as Derby set to work on the BR/Sulzer Type 4's. These early machines were too large for Britain's loading gauge, their LDA31's were pared down to LDA28's, more useful for fitting into locomotives destined for restricted European loading gauges. Nevertheless these were still large engines particularly when coupled to the large generators required to convert that mechanical energy into electricity. These heavy internal components required substantial framing and support from the body, which was also filled with auxiliary equipment, train heating boilers, water and fuel, all red flags for those trying to keep the axle loadings as low as possible. Unable to keep the weight down to an acceptable level for the Civil Engineer both BR Derby and English Electric had to resort to the four-axle bogie for the big Type 4's, an option that the designers would have no doubt preferred to avoid. Thus was born the early heavyweight diesel electrics, their bulk not being reduced by the Derby built Type 4's being named after mountains and certain English Electric Type 4's being named after large ships! The first of the frames for the BR/Sulzer Type 4's were laid down at Derby during 1958, they would keep company with Type 2's D5011-5013 in the early build out. By the beginning of 1959 D1 - D4 were substantially complete in respect to bodywork, the fitting of the internal components followed, but seemed to occur at a slower pace than the Type 2's alongside. During the middle of April D1 was noted in the paint shop, whilst construction had commenced on D5. By the middle of May D2 was complete and construction had started on D6. Little seems to have been reported of D1's movements during the summer whilst it was being tested. On July 14th it was officially named at Carlisle Citadel by Sir Fergus Graham, Lord Lieutenant of Cumberland, the station had been specially spruced up for the occasion. Despite this naming ceremony D1 - D10 all had their nameplates fitted at Derby Works prior to entering service, the names chosen led to the big Type 4's earning the class the nickname of 'Peaks' - even for the follow on builds that carried mostly regimental names. D1 officially entered service during the four weeks ending September 5th 1959. Also delivered at this time from a variety of builders were D224, 810, 2117, 3779, 5336, 6122, 8035 & E5010. D1 was officially allocated to Camden (1B), but was quickly loaned to Derby (17A), a sequence of events that happened to the remainder of the class when they were delivered. The last of the class, D10 was delivered to Camden in the three weeks ending February 20th 1960. Period reports do not make mention too much of the activities of D1 - D10. Despite there allocation they were split between services out of Euston and St Pancras. On the latter route they were active on the Manchester services alongside the D57xx Metro Vicks, in particular the 7.25 am Manchester Central - St Pancras, returning with the 2.25pm St Pancras - Manchester Central. After the delivery of D10 in February Derby Works started quickly into the order for the more powerful Class 45's, an order that was to be shared with Crewe Works. Reallocations at this time centred on returning the locomotives to Camden (1B), but they would continue to be active intermittently on the St Pancras - Manchester services. However in May the class was scattered up the WCML for crew training, D1 to Longsight (9A); D2 & D9 to Edge Hill (8A); D3, D8 & D10 to Crewe (5A); D5&6 to Carlisle (12B) - something of an odd move in light of the English Electric Type 4's being the predominant diesel on the WCML expresses and that the more powerful Peaks soon to come out of Derby & Crewe would end up almost everywhere but the WCML. On March 21st D10 was exhibited at St Pancras to the Minister of Transport, Ernest Marples. Also present for inspection were English Electric Type 4 No.D255 and BR/Sulzer Type 2 No.D5079. Following the inspection D10 worked the 2.25pm St. Pancras – Manchester. One particular working associated with the Class on the WCML was the 7.45am Crewe - Euston. They would also be frequently found on the Euston - Blackpool & Crewe - Perth workings. On the Perth working there was a fill-in turn to Aberdeen, coming back with the 02.15am fish, or a passenger turn if it was Saturday. Although mostly an English Electric Type 4 turn, this did provide the sight of an occasional BR/Sulzer Type 4 at Aberdeen. During August Type 4's also starting working through to Glasgow Central on WCML passenger services from Carlisle. By July D2 & D5 were back at Camden (1B), those working north of Carlisle were reaching as far north as Perth on certain workings. A survey of WCML express passenger trains on a weekend in November at Rugby revealed five BR/Sulzer Type 4's in use, the English Type 4's were of course in the majority. During the last quarter of 1960 most returned to Derby Works for attention to a variety of things. The Type 4s continued to be occasional performers on the St Pancras - Manchester turns. With freight train working on the horizon for D1-D10 a number of tests took place to ensure there were no unexpected problems, especially with the braking capabilities. On two Sundays during June D8 and 9F 92153 trialled between Toton and Brent (via Manton) with Class J 1,000 ton partially fitted coal trains to accelerated timings. The results were favourable for the diesel with its higher brake force and smoother more even operation of the brakes. A little later, in the middle of September 1960 D4 worked a number of unfitted mineral trains between Brent and Toton. Further workings north of the border were converted to diesels, mostly the named Anglo-Scottish expresses, occasionally the Peaks would cover these turns, in particular D4. 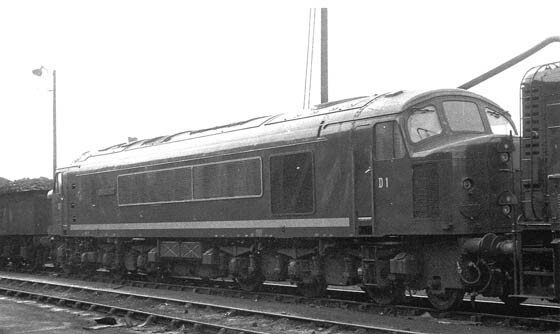 Others of the Class continued to see service on the Manchester - St Pancras workings, but with the steady introduction of the more powerful D11 series Peaks, would see diminishing use of the first ten. A traffic survey on the WCML at Watford during April found the English Electric Type 4's in command of the passenger workings, only nine were noted hauled by the Peaks. Three Peaks would be present at Derby Works for repair during May. Whilst Crewe Works was busily working through its orders of new Class 45's the occasional Class 44 would appear in the works for attention, so noted was D8 in September, D1, D8 & D9 received attention in December. It is possible that on these visits to Crewe towards the end of the year the train heating equipment was removed in light of their impending transfer to Toton for freight workings. Further south D1 disgraced itself on September 29th by catching fire near Kings Langley whilst working the 8.15am Manchester - Euston. A traffic survey at Rugby on December 23rd noted only two Class 44's passing through. During 1961 the gear ratio of D1-D10 was changed from 62/17 to 57/22 bringing these locomotives in line with the newly appearing D11 series. Tractive effort was lowered from 70,000lb to 55,000lb. This change and other internal electrical changes helped reduced the number of flashovers to the traction motors when operating at high speeds. During the early part of February D8 moved to Nottingham (16A), the precursor of the eventual move of the Class 44's to Toton for use on heavy freight duties. The other nine locomotive followed in March to Toton (18A), to be a vital piece in the continuing dieselisation of freight traffic in the East Midlands. In the middle of April D6 was transferred to Derby (17A) whilst a month later D8 moved to Toton (18A). With the arrival of five Class 46's at the beginning of May the Class J freights to Castle Donington and Repton power stations were taken over by the Class 44/46's, as were the Toton - Wichnor/Washwood Heath freights. From here on the Class 44's would be synonymous with Toton, in general only working to the limits of the route knowledge of Toton's goods train drivers and usually on out & back turns. The arrival of a series of brake tenders in August found them tested over the Midland mainline, initially by the Class 46's, but soon to be used by the Class 44's. In early June D6 was loaned to Saltley (21A) for crew training, it would be back at Toton towards the end of July. Also moving briefly was D2 which moved to Crewe (5A) during June. It would be used in high speed tests over the WCML, authorised for 100 mph running or more. It would return to Toton (18A) ast the beginning of September. D2's engine had been fitted with a supercharge-air cooler, allowing its engine to be uprated to 2,500hp. The ratings of the locomotive's electrical equipment and gear ratios remained unchanged. With the transfer to Toton the Class no longer had need of their steam generators, these were removed as they went through Works, with concrete ballast added to ensure even weight distribution. The now redundant water tanks remained on the locomotives, but since they were galvanised (unlike those on the Class45/46's) some were reused on these later classes. Crompton Parkinson: radiator fan motors, 21hp. Stone-Vapor: steam generator - 2,750lb/hr at 70lb/sq in. An elevated view of the 12 cylinder 12LDA28 power unit fitted to the Class 44's, this is the 'free' end of the engine and is home to the engine oil heat-exchanger, oil filter and instrument panel. The overhead view illustrates the two side by side (double bank) 6LDA's brought together. A close up of the free end of the engine showing a variety of equipment and the instrument board. A view of the 12LDA28 double bank engine that went into the Class 44's, and showing the considerable bulk of the Crompton Parkinson main and auxiliary generator. Receiving the electricity created by the main generator were six traction motors similar to this one. As of July 1960 Crompton Parkinson had built, or had on its order books 1,460 axle-suspended traction motors to power parts of BR's Modernisation diesel fleet. Because the traction motor and gear ratio was different between the Class 44 & the Class 45 a simple swap of the wheelsets was not possible. Some of the inner details are captured in this view of the magnet frame showing the field system and rotatable brush gear of the Type C171 traction motor - six of which powered the Class 44's. The 12LDA28 power unit carried by the Class 44's was of the type initially installed in twenty locomotives supplied to the SNCF during 1955 for the Ceinture Railway that encircled Paris. The testing was carried out between March 5th-9th 1956 at Winterthur under Test UIC specifications 623-OR using power unit E 775055 (cylinder numbers 32277 - 32288), purchased by the SNCF on February 29th 1956. This particular power unit was attached to CEM main generator # P10485 and auxiliary generator # P10508. Eighty hours was to be run at normal output, in this case the continuous rating was set for an output of 2,358hp. Forty five minutes were to be run at a ten percent overload, the output being set at 2,627hp at 750rpm. Fifteen minutes were to be at a ten percent overspeed with the generator running at 825rpm for an output of 2,605hp. An hour was then allowed for oil checks and to change the governor settings back to the normal output to allow the running of the next ten hours of the test. The next ten hours of the test was broken into four one hundred and fifty minute segments with the generator rpm ??? set at 700, 600, 500 & 400. The final nine hours was for the alternating load test with the engine run alternatively at six minutes normal output then four minutes at with no load, idling. Fuel consumption across the normal part of the test had a low point of 388kg/hr and a high point of 408kg/hr recorded in the 28th hour of the test. During the 10% overload fuel consumption increased to 443/444kg/hr and during the 10% overspeed test consumption increased slightly from the previous test to 447kg/hr. During the ten hour partial load test with the engine rpm set at 700, 600, 500 & 400 rpm the respective fuel consumption was 335, 234, 155 & 80kg/kr. Turbo blower (pressure charger): the speed of this device at the start of the normal test was 10,680 rpm rising to a high of 11,100rpm (26th hour), at idling speed the turbo blower ran at 2,160rpm. During the 10% overspeed test the speed varied between 11,700 & 11,820rpm. A view of one of the two substantial crankshafts fitted to the Class 44's engine, the far end shows the free end with vibration damper whilst closest to the camera is the output end connecting to the main generator. A close up of the free end of the engine showing the vibration dampers. With the inspection panels & covers removed there is a good view into the internal parts of the 12LDA28 engine. The output from the two crankshafts came together in the substantial housing in this view, showing the single gear providing the output to the main generator. The 'A' model Sulzer engines fitted to the Class 44's were all built at Winterthur with metal of thicker section than was found in the 'B' & 'C' series. This prevented the proliferation of fatigue cracks common in the crankcase and sump area found in the 'B' & 'C' series power units. In these later engines crankshaft phasing and the cylinder firing order was changed to reduce vibration - this was not done to the 'A' series power units. One problem common to both the 'A' & 'B' series power units in the early years was engine seizure due to inadequate oil lubrication of the crankshaft synchronising gears between the two output shafts and the main generator. In the same area a magnetic field occurred in the engine output shaft and crankshaft synchronising gears. This field drew fine metallic debris to the area eventually leading to seizure of the gears and bearings. The problems were rectified by improved oil lubrication and the repositioning of the internal busbars in the main generator. The first four Class 44's were named after peaks in the Lake District. The name given to the first of the Class 44's was also that of England's highest peak, at 3,210 feet (978m). It is located at the southern end of the Lake District, on a clear day from its summit one can see Great Gable, Helvellyn and Skiddaw. The nearest railway lines would be that of the WCML and the coastal route from Carnforth towards Barrow & Workington, presumably on a good day it might be possible to see Scafell Pike from some point on the coastal route. Although the frames for D1 were laid in 1958, the progress on the locomotive was slow with priority being given to the Type 2 and 0-6-0 shunter builds. By early January 1959 construction has reached the frame & body stage, by February the power equipment and other components were being fitted. By mid-March the D1 was almost complete and reached the paint shop during April. On April 8th 1959 D1 went out on a test run. The train is seen here stopped, location unknown, with a number of gentlemen in conversation, on the left in the Trilby hat is J F Harrison, CME, Derby. The locomotive appears to be in undercoat and is un-numbered, and perhaps the dark stain down the side of the locomotive is the reason for the photograph. Possibly the man in the white coat on the right is Ken Lomas, then CM&EE, Nelson Street, Derby. (Ken Lomas at one time was the No.2 in the CM&EE at the locomotive works and was very much involved in the prototype diesel & electric locomotives, including the Blue Pullman. Ken featured in the British Transport Films movie about the luxury train). By the end of April the locomotive was complete but would not officially enter revenue earning service for another four months. On April 21st D1 went up to London for inspection (being noted at St Pancras), spending several days there. It went up to London again on May 5th. Although D1 - D10 would receive their nameplates at Derby Works D1 attended an official naming ceremony at Carlisle Citadel on July 14th 1959. En route from Derby the locomotive was tested on some of the considerable pointwork at Preston before proceeding light engine to Carlisle. The above views show an incredibly well polished D1 at Carlisle at the time of its naming ceremony. The gentleman entering the cab and pulling the cord to unveil the nameplate was Sir Fergus Graham. He was Lord Lieutenant of Cumberland from 1958 to 1968. In the view on the right are there any potential railway enthusiasts out there? D1 officially entered service during the four weeks ending September 5th 1959, initially to Camden (1B), but was quickly loaned to Derby (17A). It was transferred back to Camden (1B) during April 1960. Its stay here was brief, during May it was transferred to Longsight (9A). On February 18th 1961 D1 in charge of the 2.10pm Manchester - Euston was noted at Lichfield with 42887 hauling the train, including failed D1. Thinks were not much better on September 29th 1961 when D1 caught fire south of Kings Langley whilst working the 8.15am Manchester - Euston. The damage was sufficient to send D1 of to Derby Works for attention. During November 1971 No.1 acquired blue livery. During May 1974 44001 was noted receiving its final repair at Derby Works. After outshopping the locomotive was tested on June 4th 1974 on the 13.45 Derby - St Pancras with 45005, the Class 44 was removed at Leicester. 44001 stands in the erecting shop minus its bogies on May 4th 1974. The builders plate and nameplate are still attached, at a later date these would be removed by Toton staff for safekeeping. Also just visible below the driver's side window is the driver's nameplate holder, a steam era feature which has somehow survived on 44001 through several major overhauls. 44001 has just over two years of service left prior to withdrawal from Toton during October 1976. On November 6th 1974 44001 worked the 11.35 Toton - Severn Tunnel Junction freight throughout. On October 27th 1976 44001 failed on the 8L21 07.20 Toton - Garston freight in the Stoke area. 44006 came to take 44001 back to Toton where it was withdrawn on October 30th 1976. A week later on November 6th it was towed to Derby Works by 20182. By the end of February 1977 44001 was little more than an empty bodyshell dumped in the scrapping area, for a while keeping company alongside the remains of 44006. Its February 23rd 1973 and Toton, as usual is home to 1 'Scafell Pike'. The locomotive received BR Blue livery in November 1971. A snapshot of 44001 heading north from Peterborough as it is overtaken by an ECML express. The Class 44's were frequent visitors to Whitemoor (March) on out and back turns, its a dull May 19th 1976. Helvellyn is the third highest English peak at 3,118 feet (950m) offering many splendid views of the Lake District as it sits above the valley containing Thirlmere. Helvellyn was no doubt visible from the railway line that passed through Keswick and might (?) be visible from the WCML looking south west from Penrith on a really good day. Prior to entering traffic D2 was complete enough to be on show at the Works Open Day on August 29th 1959. D2 was delivered to Camden (1B) in the four weeks ended October 3rd 1959, it was immediately loaned to Derby (17A). During May 1960 it was transferred with D9 to Edge Hill (8A). After two months on loan to Edge Hill D2 returned to Camden (1B) during July 1960. From new D2 was rated at 2,500hp, running with a 'B' series engine after the original 'A' series engine had seized whilst under static testing at Derby Works. The testing would have provided service experience for the soon to be introduced D11 series locomotives. The locomotive was derated to 2,300hp during July 1961 by Sulzer staff at Camden depot. Presumably at its next Works visit the 'B' series engine was exchanged for an 'A' series. In August 1962 test trains were run on the WCML between Liverpool & Euston to evaluate the performance of the overhead line equipment and to confirm that the infrastructure of the route (track condition, signals etc) would meet the rquirements of the upcoming high speed services. The test trains included a test coach equipped with a pantograph, a track recording coach and coaches equipped with Mk1 bogies and Commonwealth bogies. On August 9th 1962 D2 and three coaches ran to electric timings running at over 100mph on certain sections and time from Crewe to Euston at 157 minutes. The view is undated but the locomotive is D2 on test at Stafford. D2 returned to the WCML during June 1964 when the locomotive operated out of Camden depot on further high speed test trains between Euston & Liverpool. On June 24th D2 and a seven coach test train made a round trip Euston - Liverpool with considerable running at 100mph plus. The down trip was made in 2hrs 54min, the up trip in 2hrs 41min. By June 27th the testing was finished and D2 was back on more mundane duties at Toton. During May 1972 No.2 acquired blue livery. The last overhaul for 44002 took place at Derby during June 1975. Because of the popularity of the first D.A.A. Railtours/Diesel & Electric Group 'Peaks Express' run on October 1st 1977 and which was sold out, a second ten coach train ran on October 15th 1977 using three different Class 44s. 44002 worked London St Pancras - (via MML) - Kettering - Corby - Manton Junction - Syston North Junction - Loughborough - Trent - Toton, then 44004 Toton - Trowell Junction - Clay Cross South Junction - Chesterfield -Foxlow Junction - Beighton Junction - Treeton South Junction -Shepcote Lane Junction - Woodburn Junction - Sheffield Victoria - Woodhead - Dinting- Manchester Piccadilly - Ardwick - Romiley - New Mills Central - Chinley - Edale - Grindleford - Dore South Junction - Chesterfield - Toton, then 44007 Toton - Leicester - via MML - London St Pancras. On December 21st 1977 44002 was noted arriving at Toton with a freight from the south. 44002 was sent up to Cricklewood light engine on September 4th 1978 to bring back three surplus slow speed control fitted Class 47's. On February 1st 1979 44002 was withdrawn from service, and moved to Derby Works. 44002 surrendered her engine for reconditioning and installation in 44007. By September it was just a shell in the scrapyard area. 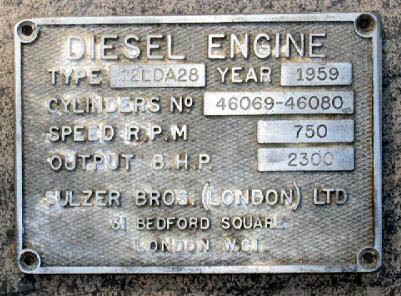 A nameplate from 44002 sold for GBP8,900 at auction in March 2005. Another view from Toton on February 23rd 1973 finds 2 awaiting its next turn of duty. A mutilated 25295 keeps company with a stripped 44002, a pair of Class 25 bogies and a power unit at Derby Works on July 4th 1979. Photograph collection of Malcolm Lowe. 44002 & 25295 have been positioned on the scrap road at the back of the Works, seen here on October 7th 1979. The number panels have already been removed. Skiddaw sits at the northern end of the Lake District, reaching a height of 931m. On a clear day it is visible from the Workington - Carlisle railway and would have been very prominent on the CK&P line which ran through Keswick, though its doubtful if any Class 44's traversed this route before its closure. D3 was delivered to Camden (1B) in the four weeks ended October 3rd 1959, it was immediately loaned to Derby (17A). It was transferred back to Camden (1B) during April 1960. It did not stay here long, during May it was transferred with D8 & D10 to Crewe North (5A). D3 was noted at Derby Works for repairs during April - June 1961. The last overhaul for 44003 took place at Derby during June 1973, which is when it acquired blue livery. On March 30th 1976 whilst working the 8E12 14.17 Toton - Whitemoor 44003 failed at Loughborough and was rescued by 44009, the following day on the same working 44003 failed again and was assisted this time by 44002. The locomotive was immediately stored unserviceable, but did not reach Derby Works until May 7th 1976, with final withdrawal occurring on July 17th 1976. By the end of September it had been broken up, the first of the Class 44's so treated. D3 strikes an impressive pose by the Test House at Derby Works, probably not long after completion. D4 was delivered to Camden (1B) in the four weeks ended October 3rd 1959, it was immediately loaned to Derby (17A). It was transferred back to Camden (1B) during April 1960. After returning to Camden D4 became a regular performer on the 07.45am Crewe - Euston. For the period September 12th - 24th 1960 D4 worked a number of trials with unbraked mineral trains between Cricklewood and Toton. The increasing use of diesels on diagrams north of Carlisle in January 1961 generally saw these covered by the English Electric Type 4's, but D4 was also noted on these diagrams. D4 was the first of the Class 44s to receive blue livery, being repainted in February 1967 (the blue livery was unlined with small yellow warning panels), it would not be until August 1970 that the next Class 44, D5 would be repainted blue. 44004 was noted at Derby Works during October 1975 receiving its last overhaul, being outshopped early in November. On January 20th 1976 44004 worked a Slough - Leicester parcels. It was observed in the Birmingham area on January 14th 1977 in charge of the Slough - Leicester parcels. It was later noted in the Stoke area on April 5th 1977 having brought in a coal train from the East Midlands, normally a Class 45 or double-headed Class 20 turn. On December 21st 1977 44004 was noted arriving at Toton with a freight from the south. On January 18th 1978 44004 ran up to Bedford light engine to haul a defective 45103 back to Toton for repair. 44004 worked a Toton - Three Spires coal train on April 29th 1978, returning as far as Nuneaton light engine. A morning Toton - Whitemoor freight was worked by 44004 on July 13th 1978. One of the regular out and back Toton turns which occasionally used a Class 44 was the morning trip to Stoke on Trent and the early afternoon return working. On November 15th 1978 44004 failed in the Stoke area on the return working, 47315 was added to the train to complete the journey back to Toton. Also recorded on the evening of November 15th, presumably after 44004's return to health, was its rescue of the 20.45 Sleaford - Lincoln diesel multiple unit. On April 6th 1979 44004 worked a morning freight to Stoke on Trent. On September 19th 1979 the 08.55 Bescot - Toton freight with 44004 became derailed between Pleck Junction & Walsall, the locomotive and two wagons came off the rails. On July 15th 1980 44004 worked a special freight Toton - Whitemoor, returning light engine. On July 18th 1980 44004 worked two Toton - Rugby roundtrips. On September 8th 1980 44004 worked the midday Toton - Rugby coal. On the morning of September 17th 1980 44004 was noted at Nuneaton heading towards Leicester with a train of vans. Its last working was the 21.36 Toton - Whitemoor on November 28th 1980, returning light engine. On November 30th 1980 the last three Class 44s were withdrawn, including 44004 which was initially stored at Toton but eventually reached preservation. D4 sits centre stage at Toton, date unknown. 44004 makes a fine sight as it rolls northbound through Chesterfield on a Toton - Tinsley freight, one of the staple workings for the Class 44's in their later years. Its August 28th 1979 and 44004 still has over a year left in BR service. After four Lakeland Peaks the next four were selected from the Pennines. Cross Fell, 2970feet (893m) is the highest peak in the Pennines, is the source of the Tees River and is visible from the Settle & Carlisle railway line, though it is doubtful if the Class 44's worked over this route. D5 was delivered to Camden (1B) in the two weeks ended October 17th 1959, it was immediately loaned to Derby (17A). It was transferred back to Camden (1B) during April 1960. It did not remain here long, in May it was transferred with D6 to Carlisle (12B). After two months on loan to Carlisle D5 returned to Camden (1B) during July 1960. During August 1970 No.5 acquired blue livery. The last overhaul for No.5 was completed at Derby during the first half of November 1973, at which time it was renumbered to 44005. On May 11th 1977, the same day that 44010 worked its last trip, 44005 ended up in charge of a Crewe - Ferme Park empty coaching stock working, the locomotive quickly returning light engine to the LMR. 44005 was frequently noted on the 08.10am Toton - Whitemoor freight during April. It was also used on the clean-up at Ilkeston following the collision & derailment of 45067 and its passenger train. 44005 was withdrawn at the end of April 1978 with generator damage, initially stored at Toton but moved to Derby Works on July 31st 1978, just in time for the Works Open Day. The locomotive had been cut up by November 1978. On October 1st 1977 three Class 44s were used on the ten coach D.A.A. Railtours/Diesel Electric Group 'The Peaks Express' with 44005 working St Pancras - (via MML) - Kettering - Corby - Oakham - Melton Mowbray - Manton Junction - Syston North Junction - Loughborough - Trent - Toton where 44008 took over Toton - Trowell Junction - Clay Cross South Junction - Chesterfield - Beighton Junction - Treeton South Junction -Shepcote Lane Junction - Woodburn Junction - Sheffield Victoria - Penistone - Woodhead - Dinting - Guide Bridge - Ashburys - Manchester Piccadilly - Ashburys - Romiley - New Mills South Junction - Chinley - Edale - Grindleford - Dore South Junction - Chesterfield - Clay Cross South Junction - Trowell Junction - Toton, where 44009 took over Toton - Trent - Leicester and MML - London St Pancras. An early view of D5 not long after release to traffic, probably photographed at Derby. This almost new view of D5 shows some of the features originally carried by the Class 44's that were removed over the years. On the bogies can be seen the four sandboxes originally fitted, from the late 1960's the innermost ones were removed. At the same time the forward/reverse sanding controls were removed, allowing sanding only in the forward direction. Also on the nearest bogie is the two sets of footsteps, one for access to the cab, the other to the roof mounted boiler water filler. This latter set of steps would be removed when the use of the boiler was no longer required. On the left (No.1 end) bogie, to the left of the speedometer cable connection can be seen the axlebox mounted oil pump which was used to power the oil lubrication system for the pony truck steering linkage, springs, segmental bearings and axlebox roller bearings. This method of lubrication proved not to work too well and led amongst other things to bogie fires. When the lubrication was changed to grease in the early 1960's this pump equipment was removed. With just three coaches in tow D5 pauses at Belper date unknown. The multiple unit working cable has been removed, a 16A shed plate is bolted to the front, the bodyside has lost its grey stripe and the main grille is no longer trimmed in grey. The Derby Works Open Day in September 1978 provided visitors with one last look at 44005 as it is seen here being stripped of parts prior to removal to the scrapping area. Whernside, the highest peak in Yorkshire at 2,415feet (736m) is easily visible to the north west of Ribblehead. D6 was delivered to Camden (1B) in the two weeks ended November 14th 1959, it was immediately loaned to Derby (17A). It was transferred back to Camden (1B) during April 1960. It did not remain here long, in May it was transferred with D5 to Carlisle (12B). When No.6 entered Derby Works during June 1973 for its final overhaul it was the last Class 44 to retain green livery - when released to traffic early in September it had gained the familiar blue & yellow livery. It had also been renumbered to 44006, thus being the only Class 44 not to carry green livery with its TOPS number. The end came for 44006 on December 13th 1976 whilst working the 21.36 Toton - Whitemoor freight. Whilst shunting at Spalding the locomotive became derailed. After re-railing the next day 44006 was moved to March on December 20th, 44008 was sent down from Toton to collect 44006 on December 21st. Withdrawal came on January 25th and on February 2nd 44002 took 44006 to Derby Works. By early March 44006 had been broken up. Carlisle Upperby depot on May 9th 1960 finds D6 laying over between duties. A hazy, frosty morning catches D6 on an engineers trains, date, location & photographer unknown. A MkII Cortina defers to 44006 and its lengthy freight train as it approaches Attenborough station heading east towards Nottingham. Its March 12th 1977 and 44006 is little more than a frame, bulkheads and side panels. 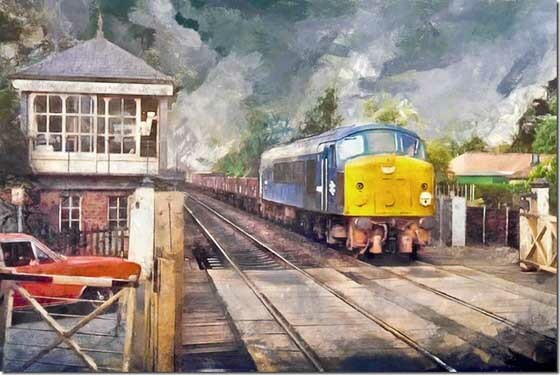 In contrast to the earlier slide of 44006, here is a painting of the same view!! Thank you Richard. At one time its striking flat top was home to an iron age fort, but now Ingleborough, 2,373feet (723m) receives more attention from hikers and the longing looks of travellers up and down the Settle & Carlisle railway line. D7 was delivered to Camden (1B) in the two weeks ended November 28th 1959, it was immediately loaned to Derby (17A). It was transferred back to Camden (1B) during April 1960. The last overhaul for 44007 took place at Derby Works during March 1973, it was at this overhaul that blue livery was received. On November 5th 1974 44007 worked the 11.35 Toton - Severn Tunnel Junction freight throughout. 44007 was noted at Derby Works from June to August 1975. 44007 was noted on a Bescot - Toton freight on December 13th 1977. 44007 arrived from the north at Toton depot on December 21st 1977. On November 20th 1978 44007 and a train of coal wagons were noted southbound at Burton on Trent. On March 5th 1979 44007 worked the 6Z72 Toton-Acton special freight throughout, quickly returning home light engine. 44007 came to the rescue of a passenger train on April 19th 1979 when the 15.16 Manchester - Harwich Parkeston Quay failed at Chesterfield behind 31242. Nearby was 44007 which was added to the train, reaching Nottingham about an hour late where 47533 replaced both locomotives. On July 15th 1980 44007 worked an early morning Toton - Three Spires freight. The next day (16th) 44007 worked a mid-morning Toton - Corby freight returning light engine. On July 31st 1980 44007 was noted on the WCML with accident damaged coach M12162 (covered with a tarpaulin), presumably en-route from Watford Junction to Derby Carriage & Wagon Works for repairs. On September 16th 1980 44007 worked the midday Toton - Rugby coal. The next day (17th) 44007 was noted at Nuneaton heading towards Leicester with a train of loaded coal wagons. 44007 was noted on a Toton - Willesden working on October 9th 1980. On November 30th 1980 all three remaining Class 44s, including 44007 were withdrawn. 44007 was in working condition allowing it to run light to Derby Works on December 2nd 1980 for the last time. It had been broken up by November 1981. D7, not too long out of Derby Works, at Manchester Exchange on an unknown date, presumably with a St Pancras - Manchester working. One feature unique to the Class 44's is visible at the cantrail level above the radiator grille where the rain gutter strips change elevation - the small vertical vent provided ducting to the outside for the radiator fan motor. Also noticeable are the longer cab handrails carried on D1 - D10. Photograph collection of Les Morton. An early view of D7, date and location unknown. The locomotive still retains its roof mounted water filler cover, these did not remain on the locomotives very long and it appears little attempt was made to make the cover more useable. D7 with its workworn livery at Toton, presumably on a weekend, when the Class 44's had very limited duties. Its September 22nd 1978 and 44007 is on one of its typical workings - a round trip from Toton to the Birmingham area, seen here at Ryecroft Junction. 44007 heads home for Toton on June 29th 1979, seen here passing Tapton Junction, Chesterfield. Situated on the east side of the Settle & Carlisle railway Penyghent is 2,273feet (694m) high. D8 was delivered to Camden (1B) in the three weeks ended December 19th 1959, it was immediately loaned to Derby (17A). During May 1960 it was transferred with D3 & D10 to Crewe North (5A). With the future transfer of D1-D10 to Toton for use on freight trains on the Midland mainline some trials were conducted to ensure their suitability, especially with regard to their braking abilities. Trials were conducted between Toton, via Manton to Brent Yard with a 1,000ton train comprised of 85 coal wagons, brake van and dynamometer car. 9F 92153 tested on Sunday June 19th 1960 followed by D8 on June 26th 1960. Brake tests were carried out on the partially fitted coal train at several points on the route. D8 proved to have superior braking performance over 92153, having a higher brake force and smoother operation of the brakes. On November 11th 1960 D8 was in charge of the 1.5pm ex-Euston, by Camden the steam heating boiler had failed, a steam locomotive was added at Rugby, both were replaced at Crewe by D205. During September 1961 D8 was noted at Crewe Works for attention. During July 1971 No.8 acquired blue livery. After the few remaining Class 44's had acquired celebrity status it was no surprise to find 44008 at Coalville Open Day on August 20th 1978. Another of the local out & back jobs handled by the Class 44's was the 18.30 Toton - Tinsley freight, which included the Celanese tanks tripped from Spondon - also a Class 44 job, so noted on this duty was 44008 on April 5th 1979, and 44004 the following day. 44008's last overhaul was at Derby Works during August/September 1974. On September 24th 1977 the thirteen coach LGCB 'Peak Farewell' was worked by 40135 & 44008. 40135 worked Liverpool Lime Street - Manchester Piccadilly - Hope Valley - Toton, where 44008 took over Toton - Oakham - Peterborough - March - Spalding - Sleaford- Barkston East Junction - Allington Junction - Bottesford - Nottingham - Toton where 40135 came back on for Toton - Stoke-on-Trent - Crewe - Manchester Piccadilly -Liverpool Lime Street. A week later on October 1st 1977 three Class 44s were used on the ten coach D.A.A. Railtours/Diesel Electric Group 'The Peaks Express' with 44005 working St Pancras - (via MML) - Kettering - Corby - Oakham - Melton Mowbray - Manton Junction - Syston North Junction - Loughborough - Trent - Toton where 44008 took over Toton - Trowell Junction - Clay Cross South Junction - Chesterfield - Beighton Junction - Treeton South Junction -Shepcote Lane Junction - Woodburn Junction - Sheffield Victoria - Penistone - Woodhead - Dinting - Guide Bridge - Ashburys - Manchester Piccadilly - Ashburys - Romiley - New Mills South Junction - Chinley - Edale - Grindleford - Dore South Junction - Chesterfield - Clay Cross South Junction - Trowell Junction - Toton, where 44009 took over Toton - Trent - Leicester and MML - London St Pancras. The last official Class 44 hauled passenger working took place on January 21st 1978 over the route Nottingham - Chesterfield - Woodhead - Guide Bridge - Stockport - Crewe - Chester - Shrewsbury - Wolverhampton - Walsall - Burton - Nottingham. 44009 worked the Nottingham - Crewe portion, 44008 worked the remainder of the trip back to Nottingham. On February 20th 1978 44008 was noted northbound at Peterborough hauling 56037 and its train of empty flyash wagons back to Toton. On April 5th 1978 44008 was noted at the roadstone sidings at Kennett. On April 5th 1979 44008 worked a morning freight to Stoke on Trent. When Toton had its Open Day on June 9th 1979, the three active Class 44s (44004, 44007, 44008) were present as was withdrawn 44009. By the end of August 44008 had regained its lower body level stripe, reminiscent of its original livery, it also carried D8 at one end. Surprisingly 44008 visited Derby Works during November 1979, not for scrapping but for engine repairs, it was also at this time that 44009 appeared at Derby for scrapping, possibly giving its engine to 44008?? It would remain under repair at Derby until early July 1980 when it was tested on July 10th on the 12.07 Derby - St Pancras, 45121 was the train engine and 44008 was removed at Leicester, returning light engine to Derby. It had retained blue livery with lower white stripe, with D8 at one end. 44008 was noted on a Toton - Willesden working on October 10th 1980. Despite its recent Works attention 44008's reprieve was brief, it was withdrawn along with the two remaining Class 44's on November 30th 1980 with turbo charger problems, and stored at Toton. An overcast day finds two of Derby's products working their way past the station at 3.15pm on ???? An odd couple in many respects, the Class 44 built to immense proportions yet the Class 25 seems an offshoot of Derby's historic small engine policy from Midland Railway days. Criticism has often been levelled at the Peaks for their bulk, but there's never much praiseworthy comment about Derby's attempt to go in the opposite direction with the Class 24/25. Derby Works Test House, July 4th 1980, a brief time of glory for 44008, the last Class 44 to receive attention at Derby Works. Possibly the first Class 44 to visit Glasgow Works was 44008, seen here on June 27th 1981 at the annual Works Open Day. The locomotive was heading for preservation on the Strathspey Railway at Boat of Garten. Seen here at Boat of Garten in May 1982 44008 is perhaps a little out of place, but nevertheless preserved. The Highland mainline was not frequently visited by any of the Peaks. See note below - 25901 brings 44008 from Carlisle to Crewe via the Cumbrian route, seen here passing Workington No.1 signalbox on an overcast & damp February 11th 1987. The bodywork on 25901 looks like it is just about done in, bangs and scrapes abound! Late in September 1986 the North Notts Locomotive Group had purchased D8 (44008) from its then current owner, with the Class 44 languishing on the Strathspey Railway. On January 28th 27024 arrived at Aviemore to take the Class 44 south, getting as far as Perth before brake troubles stopped the journey. Repairs were effected by February 2nd when 27050 took D8 as far as Mossend. On February 10th 20201 took D8 to Carlisle, 25901 to Crewe (11th), 25288 to Bescot (12th) and 31449 to Toton (13th). On February 16th 20100 & 20045 took D8 from Toton to Matlock. The last two names chosen were of peaks in Wales. D9 received the name of the highest mountain in Wales - Snowdon, at 3,560feet (1,085m). In Welsh it reads Yr Wyddfa (burial place). Presumably it may on a good day be visible from the North Wales mainline, a route which it is doubtful if the Class 44's ever used. D9 was delivered to Camden (1B) in the two weeks ended January 2nd 1960, it was immediately loaned to Derby (17A). During May 1960 it was transferred with D2 to Edge Hill (8A). During February 1969 D9 sustained accident damage at Trent. Repair costs were estimated at £1250 and were carried out at Derby Works which included the fitting of a standard Class 45/46 nose end with the one piece four character headcode panel, the only Class 44 to be so fitted. During March 1972 No.9 acquired blue livery. The last overhaul for 44009 took place at Derby during December 1974/January 1975. 44009 was noted at Ely on April 5th 1978 with a short train of condemned passenger coaches. On May 18th 1978 passengers on the 06.55 Gloucester-Leeds were treated to quite a variety of motive power when the booked Class 47 expired at Burton. On hand at Burton was 44009 which took the train to Derby, where 20087 & 20176 worked it forward to Sheffield from here Haymarket allocated 40142 took over for the remainder of the trip. 44009 was withdrawn on March 1st 1979 with generator problems, it was noted at Derby Works during November, possibly as a source of spares for 44008 which was undergoing engine repairs. By the end of August 1980 44009 had been broken up. Taken about the same time as the view of 44008 on the Test House (June/July 1980) 44009 was lined up for the cutters torch. Seen here it displays its modified nose after it was involved in a collision in 1969, it also kept is vertically slatted grills to the end, unique only to D9 & D10. D10 was named after the 14th highest mountain in Wales, the first of the Welsh peaks to exceed 3,000 feet, but only barely for Tryfan ('Three Stones') is 3,010 feet high. It sits close to the A5 between Capel Curig and Bangor, the nearest railways are the North Wales main line and the branch to Blaenau Ffestiniog - it is therefore doubtful if 44010 has ever come in sight of its namesake! D10 was delivered to Camden (1B) in the three weeks ended February 20th 1960, it was immediately loaned to Derby (17A). On March 21st D10 was noted at St Pancras for inspection by Ernest Marples, Transport Minister. It was transferred back to Camden (1B) during April 1960. It did not stay here long, during May it was transferred with D3 & D8 to Crewe North (5A). Derby Works carried out No.10's last overhaul during November/December 1972, at which time it acquired blue livery. 44010 was noted at Derby late in January 1975. It was stored at Toton during February 1976 then withdrawn in August only to be re-instated in October after 44001 succumbed to fire damage at that time. 44010's reprieve ended on May 12th 1977 when it suffered main generator damage working a Rufford Colliery - Avenue Coking Plant freight near Mansfield Colliery Jct. It was withdrawn the same month, moved to Derby Works by the middle of June, spending several months sitting on the Work's reception siding. By the end of October 44010 had been broken up at Derby. A side on view of D10 at Toton on February 23rd 1973. Clearly visible are the vertically slotted grilles unique to 9 & 10. The nameplate is simplicity itself and must have been one of the shortest nameplates carried by any of the diesels. Derby Works, July 3rd 1978. A small pile of parts indicates some items salvaged from 44010, including a nose crown, some roof panels, nose front indicator lights and possibly a turbocharger. Bodywork - Standard Locomotive Green to British Railways Specification 30A. Those applied by Derby Works were smaller than those added at Toton. The Toton variant used the top of the marker lights as the high point, Derby Works used the centerline of the lower discs as the high point. From 1966 the nose crowns were painted with a matt finish to avoid glare to the traincrew. Blue livery was first applied during 1966 to D6, at this time the coat of varnish was discontinued. It would not be until August 1970 that the next Class 44 would receive blue livery. By the time of the withdrawal of the Class 44's the rail enthusiast community was showing great interest in the railtours featuring locomotive classes that were not long for this world. The tours themselves tended to be pretty basic in scope particularly when specific motive power was requested. But it didn't really matter if it was a thrash up and down the West of England mainline with a pair of Westerns, or Crewe to Glasgow and back with different Class 84's. It was a day out, usually at modest cost with locomotives that we had grown up with and knew well - if the route wasn't that remarkable, well did it really matter that much? 'Borderman Railtour' 44002 + 44005 Derby - Nottingham - Sheffield - York, 55003 York - Newcastle - Lancaster - Carnforth - Skipton - Leeds - York, 44002 + 44005 York - Sheffield -Nottingham - Derby. By the time of this tour the Class 44's had been operating for quite awhile without their nameplates. These had been held at BR Collector's Corner and approval was given to return them to the locomotives for this tour. Here the plates are photographed in the garden of the BR Toton staff sent to London to collect them. A charter from Liverpool used 44008 on the Toton-Peterborough-Nottingham-Toton route. A charter from Liverpool used 44008 on the 'Peaks Farewell' railtour over the Toton-Peterborough-Nottingham-Toton route. 'The Peaks Express' St Pancras-Toton, 44005; Toton-Chesterfield-Sheffield-Penistone-Woodhead route-Manchester Piccadilly (reverse)-Hope Valley route-Toton, 44008; Toton-St Pancras, 44009. A follow up to the above railtour used the same route using 44002, 44004 & 44007 over the three legs. A fine into the hazy sun shot as 44002 rolls into Loughborough, the last pick up point for this railtour. A dull day on the west side of the Pennines made photography on this railtour the usual challenge of what to do with the gloom! However after crossing the Woodhead route the weather produced a little sunshine allowing for some better than expected lighting during the run-round at Manchester Piccadilly, where 44004 is seen backing onto its train. In the early days of the 44's Manchester was no stranger to them, though they initially ran into Central station rather than Piccadilly. A grainy late afternoon shot of 44004 at Manchester Piccadilly as it completes its run round maouevres. Nottingham-Chesterfield-Penistone-Woodhead route-Guide Bridge-Stockport-Crewe, 44009; Crewe-Chester-Shrewsbury-Wolverhampton-Walsall-Burton-Nottingham, 44008. Between Crewe & Chester 24133 was placed behind the Class 44 to provided a little steam heat on what proved to be a rather chilly day. In fact after looking at the pictures I took this day, it was a miserable day. We had driven to Trowell to catch 44009 on the first leg of the trip, the day held some promise, it was frosty with a chill in the air with a weak sun rising above the mist. After watching 44009 head north we wandered over to Stenson to catch 44008 running light to Crewe to take up its part of the railtour. By now the weather was overcast and damp, we witnessed 44009 coming back light engine from Crewe, and from the view below at Crewe it seems it was an ucky day there too! This was probably the sunniest part of the day for this railtour, however the picture reveals the unfavourable conditions prevailing at the time, this is near Trowell as the Class 44 gets to grips with the Erewash Valley main line, certainly no stranger to these tracks, but usually on coal workings. If the stock had been pre-heated it won't retain much of a comfort level for long with the door & compartment windows wide open. Another grainy shot of 44009 as it heads north. Although the Farewell tour covered the Woodhead route, this line was not normally associated with any type of Peak haulage, apart from being a diversionary route when the Hope Valley line was blocked. The increasing gloom of this damp January day does not deter those hardy souls from capturing a few photographs whilst the tour pauses at Penistone. The left hand shot also reveals that some of the locals have paused to see whats going on! Thanks to Rob Drake for making these three views available, Thanks!! At Crewe 24133 was added to the train to provide a little heat for the tour participants, perhaps the weather was meant to reflect how it frequently is miserable and wet on top of Penyghent the hill. The tour train paused at a very damp Chester, the boiler of 24133 is doing a grand job in adding steam heat to the train - it would be sorely missed since 24133 was only on the train for a short part of the trip. Page last updated January 17th 2019.